To be notified of updates to SwordSearcher, please subscribe to our email newsletter. Significant discounts are offered to current customers for the latest version. If you currently have a SwordSearcher Deluxe license (5.0 or later), you may order the latest version at a significant discount. See the revision history to see what is new since your Deluxe version. Any time you want to see what updates are available to you, open SwordSearcher and select Check for Updates from the Help menu. Get Everything! Order a Full Upgrade to SwordSearcher 8.3 (DVD or Download) and get the latest complete study library in one package; there is no need to apply multiple updates or install more than one version! The SwordSearcher Deluxe library is unified -- this means that the entire Deluxe library is included. Instead of nickel-and-diming you for each and every new library module we release --$10 here, $30 there -- you get it all for one price. To see what's been added to the library since your version, read the revision history. Click here to get your upgrade discount. 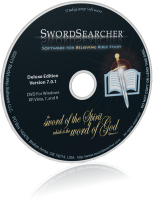 You will need your personal SwordSearcher Deluxe serial number to install the upgrade, which is included with your original SwordSearcher disc or original download email. Free program file updates add new program features and bug fixes. Free program updates do not add new modules to the Deluxe study library. If you would like the latest complete study library, please order a full library upgrade at the current user discount. We really appreciate upgrade orders because they help fund the continued development of SwordSearcher. Program file updates are free within major version numbers. For example, 4.1 can be upgraded to 4.8 and 7.0 can be upgraded to 7.2. Free upgrades to the SwordSearcher program file are made available for point releases. (See above-right.) For example, if you have version 6.0 or 6.1, you can download a free update to version 6.2 that will update the program file adding program features and fixing bugs. Free program file updates do not include additions to the module library. To get new library modules, you need a full Deluxe edition upgrade. Current customers of SwordSearcher 5 or later for a significant discount on new Deluxe Edition upgrades (DVD or download); see above-left. Please note that the SwordSearcher Deluxe library is unified. Instead of charging for each new library resource individually, the entire library is included for one price. If I order the upgrade, does it come with everything added since my Deluxe version? Yes. Upgrades always get you the latest, full version with the complete library, regardless of which version you are upgrading from. Do I need to install older versions first? No. As long as you have your serial number, you can do a fresh installation from your upgrade (download or DVD-ROM). May I give my old version to someone else? No, because the discounted upgrade price is for your license; it is not a new license for someone else. You will need to keep your serial number. Can user modules from older versions be used in SwordSearcher 8? ...have SwordSearcher 3, SwordSearcher 8 can import your User Note Sets. Use the import item on the User menu in SwordSearcher 8. ...have SwordSearcher 4, SwordSearcher 8 can import your User Commentaries and Books. Use the import item on the user menu in SwordSearcher 8. ...have SwordSearcher 5 or 6 or 7, SwordSearcher 8 will automatically retain your User Commentaries and Books when you upgrade. There is no need to import! Do I need to uninstall before I upgrade? Generally, you do not need to uninstall your old version. ...have SwordSearcher 5, 6, or 7, SwordSearcher 8 will perform an automatic in-place upgrade, which will replace your old version and retain your user modules and any third-party modules you may have. ...have SwordSearcher 3 or 4, SwordSearcher 8 will install separately from your existing installation and you can uninstall the old version any time. What's new in the latest version of SwordSearcher? What has been added since my version? How can I tell what updates are available for me? If you are using SwordSearcher 5.0 or later, open SwordSearcher and select Help, Check for Updates. This will show you if a new version is available and what has been added. You can also select Help, About to see what program version and what library release you have. Why do you charge for library upgrades? SwordSearcher's library is completely updated with an upgrade. When other companies will charge you anywhere between $10 and hundreds of dollars per book or commentary, for a small price you get everything in one package in SwordSearcher. Please consider the value of the software. For less than the cost of what it takes to buy our family a meal at an inexpensive restaurant, you can support the continued development of SwordSearcher and get the latest full version. Send an email to support@swordsearcher.com.